As savings are made in the public sector, thousands of employees will be looking for new jobs this year. The government hopes the private sector can pick up the slack, but are former public sector workers equipped for change? Dragons' Den investor and successful entrepreneur Deborah Meaden, one of four business mentors helping public sector workers facing redundancy in Newsnight's Job Market Mentors, gives her top tips on making the transition. Often when faced with something pretty traumatic like losing your job, people have a tendency to bury their heads in the sand. Don't. Doing so is bad for you, and it sends a bad message to any potential employers. If you know you are going to lose your job then be proactive and start to plan before it even happens. If it has just happened then get moving now. Watch Deborah Meaden in Newsnight's Job Market Mentors film on Wednesday 13 April 2011 at 10.30pm on BBC Two. Your CV needs more than just a brush-up. It needs to be completely re-worked and then carefully tailored for each and every job that you go for. If you send the same CV out for 10 different jobs, nine times out of 10 you will be sending the wrong CV. Employers in the private sector often have pre-conceptions about people from the public sector - that they are risk averse, that they want long holidays and short hours - you need to be able to dispel all of those pre-conceptions. Realise that you are in a new environment now and make sure that your CV works for that new environment. Don't just dwell on what you have done, but really think "how do I fit that job?" then tinker with your CV to show that you do. Stop thinking in terms of what you do and fixating on the job that you have had. Start thinking instead about the transferable skills it takes to do that job. I could take anyone who has had a job and apply at least 75% of the skills that they have acquired in it and use them in another role. Get used to the idea that the first step you take into the private sector may not be perfect. You may not get your ideal job straight away, it may be the second job or even the third that fits best, but you have to take that first step and get going. And take that step with enthusiasm - private sector employers are waiting for that hangdog public sector attitude that some think exists, that lack of enthusiasm, and you need to show that's not you. I would rather get out there and be working, even if it is not in the best job in the world, than be sitting at home doing nothing. Even if what you are doing isn't the perfect job it can still be a very good thing. Because not working for a long period can be dangerous. It is very, very easy to get out of the habit of working, and if you have long breaks between jobs on your CV it sends a bad message to prospective employers. Talk to people. Lots of jobs and business opportunities come out of conversation. People in this country often find it very difficult to say "I'm good at that", but so long as you don't say it with arrogance, and aren't afraid to also admit when you aren't so good at something there is nothing wrong with it. So think about what you are good at and talk to people, network as much as possible, keep your radar switched on and bring out ideas and plans through conversation. If you've been working in the same job for a long time it could suggest to a private sector employer that you have chosen to stay in a safe environment and are perhaps starting to wind your career down. You need to be sensitive to that and ensure that instead of fuelling that notion, you eradicate it. Be enthusiastic and passionate. It is not about age, it is about attitude. Often the best things come out of really difficult times. That idea you've been considering, that change of direction you've been thinking about - now is the time. You could now be saying to yourself: "What have I got to lose?" 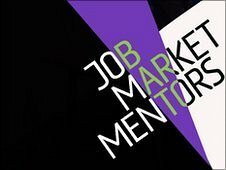 Watch Newsnight's Job Market Mentors film in full on Wednesday 13 April 2011 at 10.30pm on BBC Two and then afterwards on the BBC iPlayer and Newsnight website. Why are mortgage rates rising and will more lenders follow?